Club Penguin has announced their closure in 2 months which means we only have 2 months left to end the army on a high note. Every Nacho veteran who wants one last shot, one last ride should return for the end, the final ride. Well I’d love to participate, however I have been banned. No idea why… Mind telling me? I’ll be popping in chat here and there. Pretty busy these days but I just heard about this. This is extremely sad… we need to do as much as we can. These next 2 months need to be amazing. OMG! What will we do next? 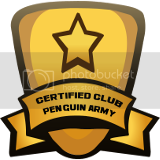 CPPS.ME? We have to have events everyday. Losing Nachos is like losing my family. We have to use our time appropriately while it still lasts…. Fab thanks for being my friend I think we might never see eachother again unless a miracle. Nachos was my first army. Take this as an retirement post. Its Centaur17. Ever since 2009,I discovered the Nachos in Blizzard, Docks. I wanted to join the Nachos as I thought it would be like World War 1 style with guns and hiding behind something and shooting at the enemy. I depicted armies back then like that. I went onto Nachos site quickly. I was only 8 or 9 years old then. I wanted to immediately check the uniform to see if there were guns. I was disappointed that there was none. I didnt understand game mechanics back then. I wanted to go on chat, eager as I were I was so stupid or probably the chat was not there. I was very, very aware that I hated clicking blue or orange links as I thought it was a virus, I didnt bother looking on the main page. I struggled finding the chat and was being absolutely angry over it. Years went on by to March 2015, 23rd. It was the most boring day of my life. I was so bored nothing would excite me. I forced myself to think so hard I punched myself in the face. I remembered orange… a red penguin in some sort of clothing. Mexican style that is. 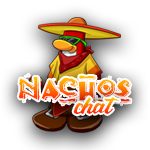 I quickly typed up “Nachos of Cp” and decided to join from the Club Penguin name I had “Centaur17” this is why I got called that. But why Centaur17 you may ask? It came from a xbox gamertag known as “SneeryCentaur17” it inspired it for me to put it as my CP account. I did and this is me. Then it started. I met lego as an mod. He was nice and he helped me become owner. Then the rivalry started. It started when I had a fight with Sarge, I wanted to use my autism as an excuse which is why you also know me as Autistic. I have aspergers and you now know that. Go search up Lego or SpRiNgTrAp559 on searchbar on this site to find it. I reset and lost it. Oh well. I came back in December 23rd. It was the first few days of me being in the christmas holiday. I was told that I was a fake cent but I am not. Im the real deal and I wouldnt of known this if I was fake. I then decided to recruit and soon learnt that Verum took the place from Ryan. It was Ryan that repelled me from even joining. I was going to rejoin in October if it wasnt for him. I was scared that he was going to ban me. He didnt seem like he liked me so I didnt want to cause trouble. I came straight after his coup. I recruited days upon no end until it came January 2017. Real stuff got down then. I felt hated, not needed and felt that everyone would never promote me. I was so upset from this unknown work that nobody even knew of. I left. Again. The 3rd time. Shocking fact is my left ear has a triangle in it. Illuminati. Anyways, I joined Purple Republic to take revenge and show Nachos that I deserved the top ranks. I had more bots than you can count I was only testing my small armada out to get used to botting. You cant stop me. I was informed that CP would close. I dont see it as closing I see it as a sequel and CP closing doesnt make sense to me as I clearly dont picture it that way. Closing something down means to me something or some brand will never re-appear or have a sequel. I really dont hate nachos I only did it because I felt so hated so deceived that I wanted to crush the rebellion I felt that I was picked on for no reason. Anyway some honourable mentions and armies that I was in. Here they are Armies to people then my goodbyes. There were many more but these were the ones I could possibly remember. Thanks so much for letting me know of this community and how to do things in xat. Without you I would be so much of a noob I would never become this well known. Thanks mate. I will find you and I will say “Yerr Man” boy. lol I am really not interested in finding you. I did it in rage. My brother is named exactly like yours. You remind me of the actual word Haze. I love eating cookies, you know what I saw you as a friend and I felt deceived. I had my angry self take control and this is where I end up. I remember you, Sarge I think you wont know this but I am sorry for fighting you early on as we met. Bryce I dont think I have Minecraft anymore so I cant go on the MC server to build all those silos. Sorry. Thanks for it. You know me now. If you are it isnt me and I would never bot an event like this. Im just spamming now arent I? 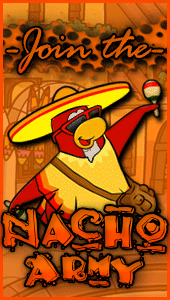 doesn’t mean that the Nachos have too.The Nachos are one of the GREATEST army’s in all of club penguin.At least that’s what i think.So i think that the Nachos should move to club penguin island.There we can have lots more room to battle,we can have so many more things to do,and finally we can have lots more people to battle against. So PLEASE can we move to club penguin island.It will be so much more fun. So please consider my offer. p.s.if you want to contact me i will be on chat most of the days until the closing after 3:30. Yeah, I’ll come back for one last hurrah, let’s do it. Vick44. Former nachos mod.Will absolutely comeback for one last go! Former nachos mod(6ic I think). I will absolutely be around towards the end.